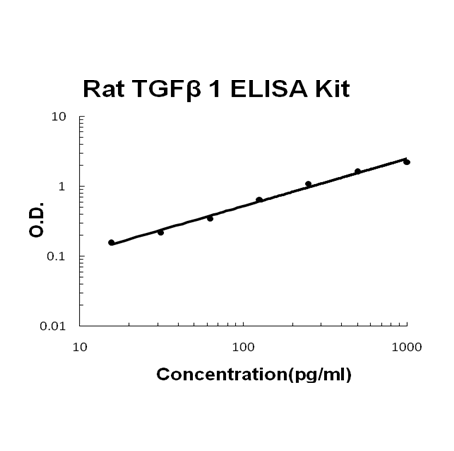 Sandwich High Sensitivity ELISA kit for Quantitative Detection of activated Rat TGF beta 1. 96wells/kit, with removable strips. There is cross-reactivity with TGFbeta2, TGFbeta3, TGFbeta5<1%. Abundant in the bone matrix. .
Multifunctional protein that controls proliferation, differentiation and other functions in many cell types. Many cells synthesize TGFB1 and have specific receptors for it. It positively and negatively regulates many other growth factors. It plays an important role in bone remodeling as it is a potent stimulator of osteoblastic bone formation, causing chemotaxis, proliferation and differentiation in committed osteoblasts. Can promote either T- helper 17 cells (Th17) or regulatory T-cells (Treg) lineage differentiation in a concentration-dependent manner. At high concentrations, leads to FOXP3-mediated suppression of RORC and down-regulation of IL-17 expression, favoring Treg cell development. At low concentrations in concert with IL-6 and IL-21, leads to expression of the IL-17 and IL-23 receptors, favoring differentiation to Th17 cells (By similarity). .